Aya is a U.S.-schooled architect who does consultancy work for clients in Hong Kong and the U.S. She’s an entrepreneur who owns the thriving chocolate and coffee shop of six outlets, Tablea. She’s a mother of Ana, 6, and Ari, 3. Her husband is Larry Shlachter, who’s finished three New York City Marathons. Aya is a multi-tasker. Aya is a multi-sport athlete. 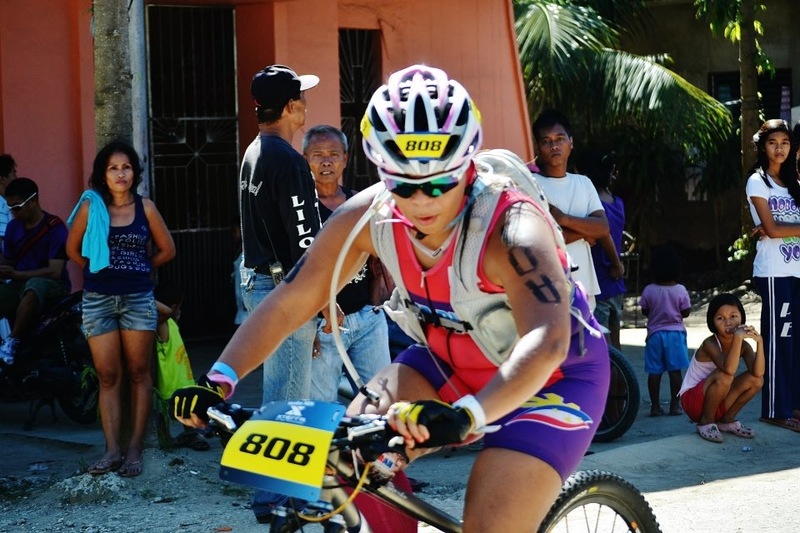 Two Sundays ago, she finished what I consider one of the most fearsome of outdoor gimmicks: the XTERRA Off-Road Triathlon. Consider this: of the 219 who finished the full triathlon (1.5K swim, 36K bike and 10K run), only 21 were women. During this International Women’s Month, Aya shows the boys that they’re not the only athletic type. 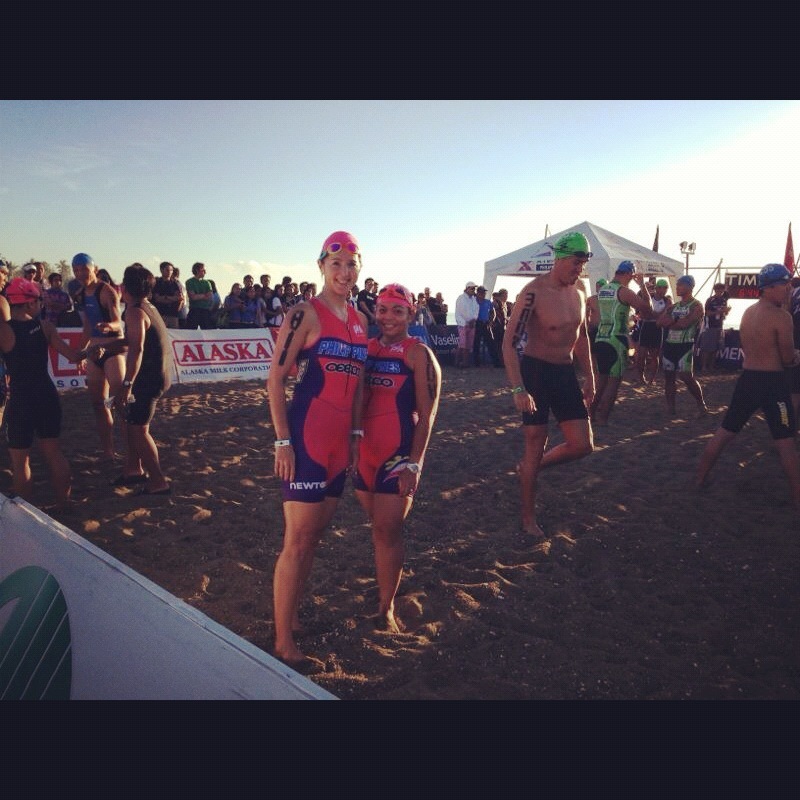 Last year, Aya completed the Cobra Ironman 70.3 Ironman race. Before that, she completed the Tabuelan 111 event. Prior to that, she swam 6 kms. in the Olango Challenge. “Swim: I love swimming and I am most comfortable in the water. The first 500 meters was a warm up and easy swim for me. The rest of the distance, I did some swim intervals. Slow easy pace for 3 minutes followed by 20 fast strokes. That way, I was able to conserve energy for the bike and run portions. 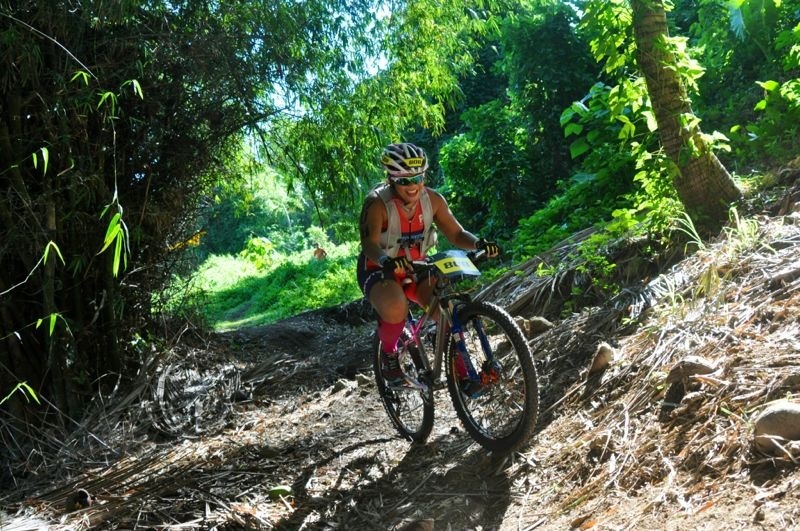 “Bike: The bike portion was the most challenging since I had only been mountain biking for 2 months prior to Xterra. My bike handling skills are a bit challenged. My goal for the bike portion was to finish injury-free without getting cut-off. I had targeted to finish 1 loop in 2 hours; the problem was, I had no idea how long one loop would take since I had not finished one loop during training sessions. On the first loop, at 1:40 I saw Noy Jopson and he told me that I was making good time and that I was close to making the first loop in less than 2 hours. Noy gave me the boost and self confidence that I badly needed. I made it to the transition area 30 mins before cut off. After the bike portion was completed, I knew I was going to finish the race. Aya’s 2013 calendar? She plans a full marathon, a few “more Xterra races” and, here’s the ultimate: she will go for the Timex 226! (That’s a 3.8K swim, 180K bike and 42K run.) If that’s not enough, she already has booked Nov. 2014 for a full Ironman race in Arizona. “Mr. Ugo 37K Sky Run was a trail run (in Itogon Benguet province) where the first 18k were all uphills until we reached the Mt. Ugo Summit, then 18k back downhills It was a very tough and mentally-challenging course. It took me 10 hours. There was a cut off time of 8:30 hours and, though I did not make the time, I still finished the race. Fifty meters before the finish line, my friends (Sen Pia, Belle, Che, Noel) were hiding behind a big rock. They emerged from the big rock and surprised me with my own finish line. They brought me fruits and water. We were all in tears,” said Aya.